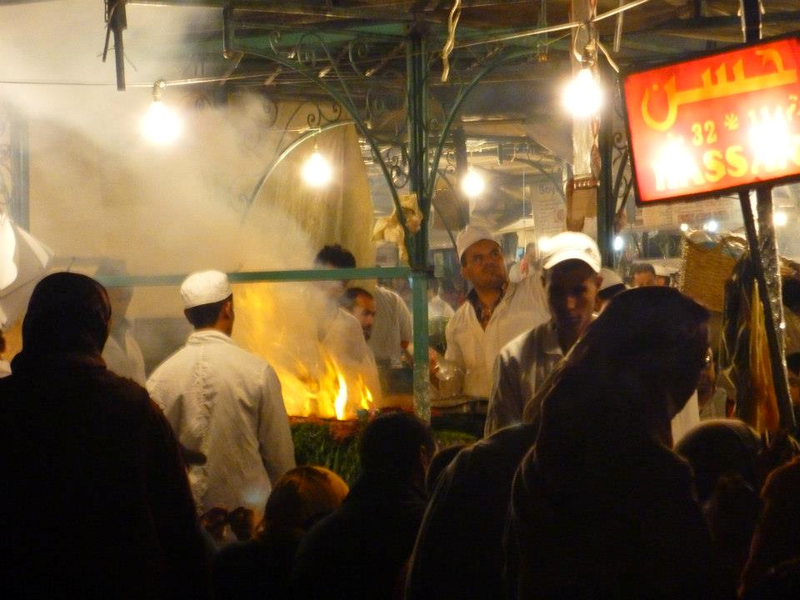 Marrakech – or is it Marrakesh – who cares? It’s warmer than here and it’s great! This weather is glorious, but just a few short weeks ago, when it was snowing/raining/hailing/sleeting I was sitting in the warmth of the sun on a rooftop in Marrakech. It was lovely…. 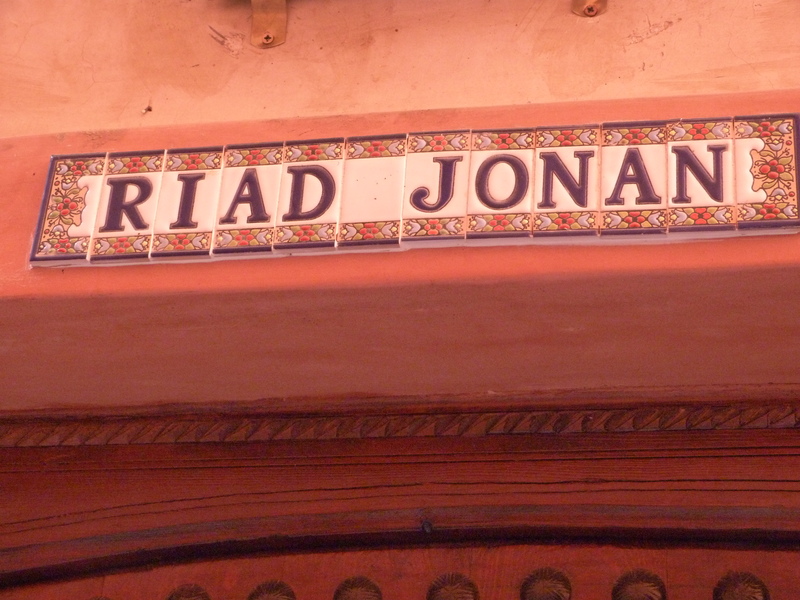 Our riad was called Riad Jonan – which I took as a good sign – it’s my childhood nickname and it was off the Rue de Kasbah, so I suppose I can legitimately say we were rocking the Kasbah. I like this. 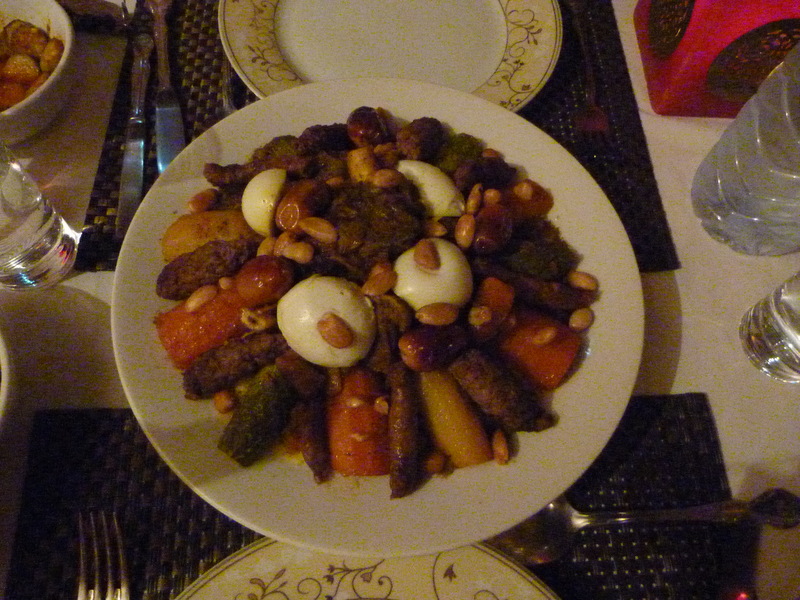 We had decided to pay extra to have dinner at the Riad on the first night and they certainly didn’t let us starve….a tagine if my memory serves me correctly, with lamb . Come Dine with Me would never be the same again. The next morning, after the most divine breakfast, think homemade yogurt, stewed fruit, fresh pastries (the French influence is evident here – YUM), Moroccan pancakes (I’m still trying to find a recipe for these they were SO good). We haven’t finished yet: the omelette or scrambled eggs. All included in the room. The next day we decided to walk to the New Town before we hit the madness of the Souk. The difference is palpable, it’s very colonial/modern – La Grande Cafe de La Poste where we stopped is a good example – as you can probably tell from the name it’s the old Post Office, converted to a restaurant/cafe. I kept forgetting that it’s a ‘dry’ country as they are Muslim – no alcohol is served outside Westernised or tourist places – if we were sitting inside it would have been acceptable to have wine, not outside, but to be honest it wasn’t really an issue. Yes, really. It was stranger seeing people smoking – INSIDE, even though I no longer smoke, I was almost tempted. Almost. 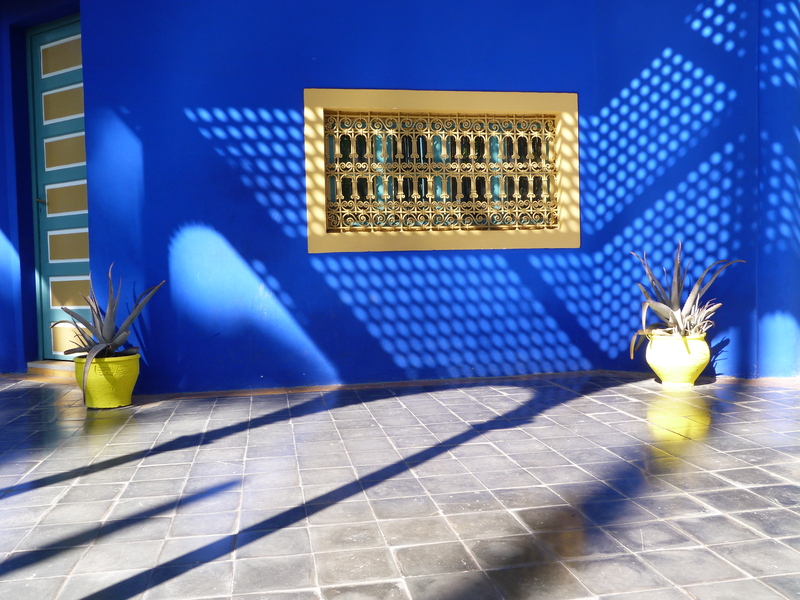 Next stop, feet rested, – we walked all the way – was the Majorelle Gardens, which were bought and restored by Yves Saint Laurent. Unfortunately they were renovating parts of it, so we didn’t get to see it in its full glory, but nothing could detract from the AMAZING colours. As you can see here. I don’t know if they would like quite so stunning in a grey and rainy Tooting flat (I had all sorts of grand plans! ), but here they were stunning! We caved and a taxi back to the Riad and decided that before we finally ventured to the Souk we should go to go the Government Emporium , where prices are fixed so we could get an idea of what we should be paying in the Souks – and how much we could expect to barter. You could buy absolutely anything, and I mean anything – from model aircraft and tanks fashioned from bullets (good luck getting those through customs) to Virginity soap, formulated to help you keep it – yes really (*raises eyebrows*). 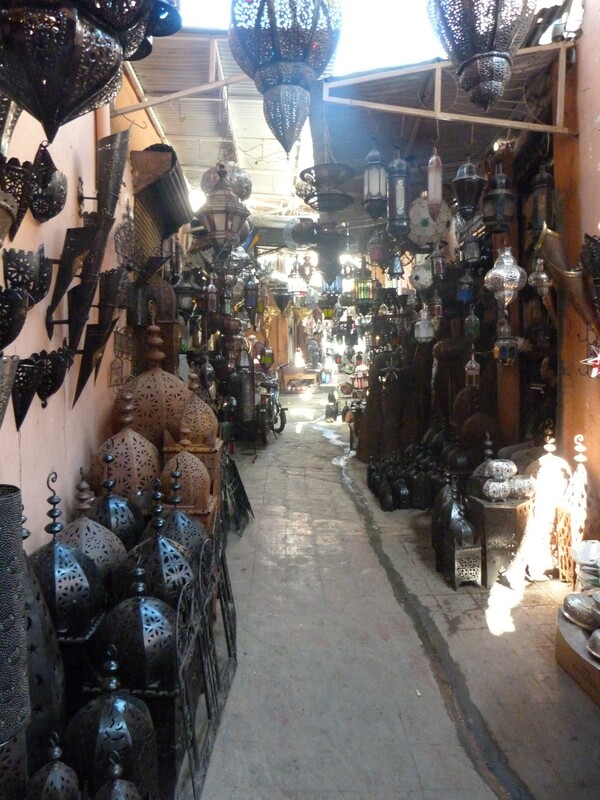 Got hopelessly lost in the souk. (A word of warning: If anyone says they are doing anything for free and they don’t want any money – THEY probably DO – which is fine if you’re happy to part with your money by the way – lots of people do.) 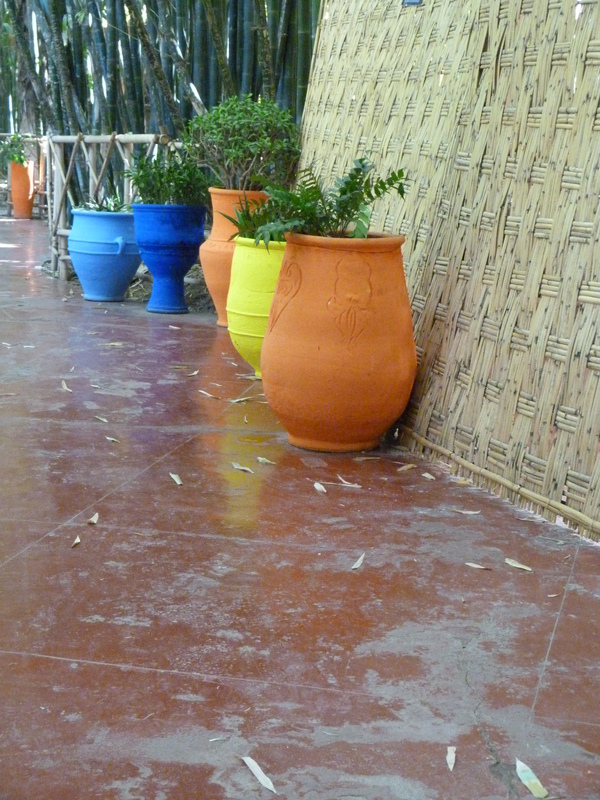 We eventually found a bar/restaurant, Le Terrasse des Epices, it was very quiet, in fact we were the only people there – it had taken us so long to get there, we had omitted to remember that at night anywhere in the middle of the Souk is going to be both. We decided revisit it in daylight which was much more worthwhile! Straws hats supplied against the strong sun. We tramped, exhausted back to Jemaa el-Fnaa, which EVERYONE calls The Big Square (there are enormous signs with arrows to ‘The Big Square’, specifically for numpties like us) for food. Sadly Hassan’s was a bit packed and this seemed like the place to be. What do you mean you can buy them in Homebase? We finally found something that wasn’t available in Camden market, and bought a lovely hand-stitched Moroccan pouffe from Jamal (see below – stuffed, you buy them empty) – bartered down to half. Result. The bartering process is great fun – Jamal certainly seemed to be enjoying it, including my pitiful initial attempts (which he wasn’t shy in pointing out) and it’s the practically the law – but be warned it is a slow process, it took us the best part of two hours before we left with our purchases. ‘Souked out’ we decided to head back. 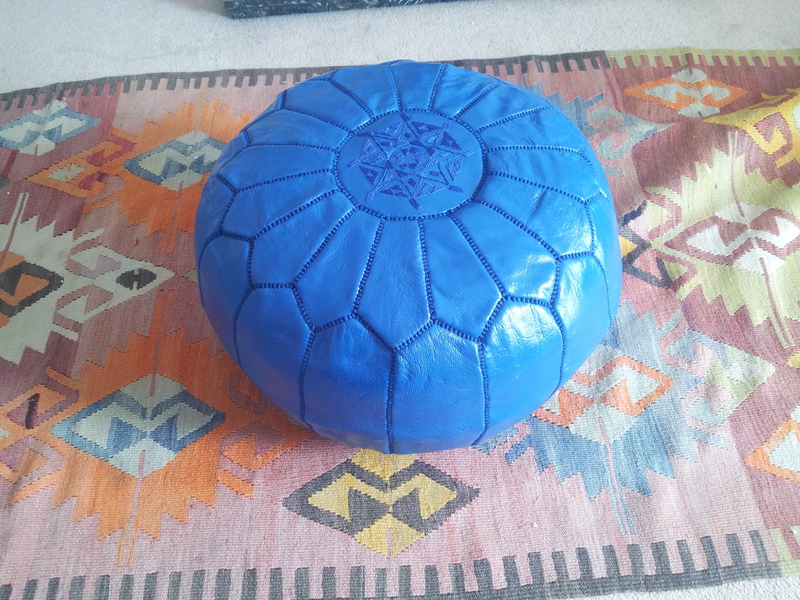 My pouffe in Majorelle blue. A little bit of Morocco in Tooting! The best thing we ate all trip were the meat skewers cooked on a charcoal grill in the street. What the locals ate, no lamb, just beef or heart/offal (ewww), we unsurprisingly opted for beef in our best French. Served in large bap, (for want of a better word). Served with red onion and coriander and sprinkled with zaa’tar (we think). To die for. On our last night we went for a meal at ‘smart’ restaurant, Le Marrakchi – all black and burgundy (I think) it was quite dark and seemed to be lit solely with enormous candelabra – which nearly set some pensioners alight several times, all it would have taken was a waft of Elnett and ‘woof!’. The views over the square were amazing but if you want a window seat, made sure you book. It doesn’t matter if there is no one else sitting there. You want window, you book. Stuffed with lamb and fig tagine and with a very passable bottle of red, we rolled back to the Riad to sit on the room terrace and reflect on our days that had just flown by. 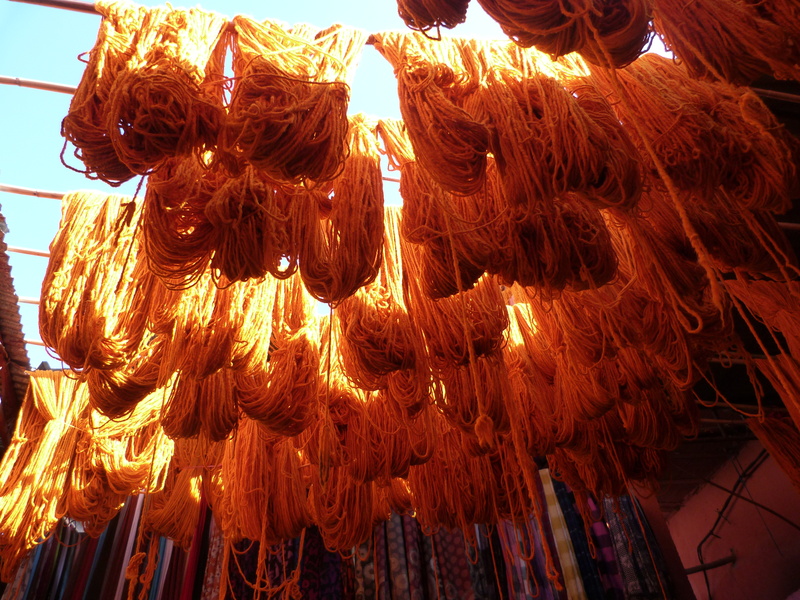 There is still so much to see and do: The Atlas Mountains, the Saadian Tombs, the windy coast of Essaouira, have a Hammam and of course – more shopping…..There’s always next time.